Do you ever see a book so pretty, you want to take it home & just stare at it? This book is one of those. Sneaking down the “grown-ups” end of the library after storytime, I found my attention snagged by the spine of “the handmade book*” by Angela James. I’ve dabbled here & there in book binding (you can see the book I made for Gail here, and one for Bee here, as well as a dramatically over-engineered sticker book for Butterfly here), and with a desire to add a monthly book review post to my blog schedule, I knew this was the one I wanted as my “test the waters” book, and into the bag it slipped, sandwiched between The Great Dinosaur Encylopedia and Maisy Goes Camping. 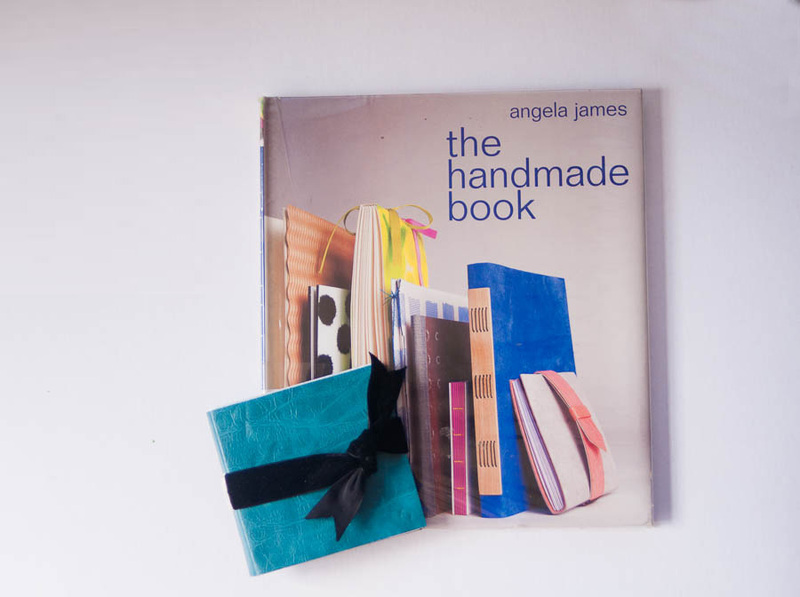 Now, call me shallow, but when it comes to craft books, eye-candy is high on the list of factors I am looking for in a book I want to keep. This book scores in all departments – clean, simple design? Check. Gorgeous projects? Check. Fabulous photos? Check. We weren’t long home from our library trip, and I was shooing the kids outside to play so I could sit with a cuppa for five and flick through this book. That was when I hit the first problem of this book. I want to make that! And that! And that as well! Make all the things!! (I guess really, that’s not considered a problem in craft book terms, is it?). Honestly, the projects in this book just beg to be made. I ended up picking a tiny 4×4″ leather bound book. You can see my version there, and the book version is the grey & pink one on the right of the cover. If I’m being honest, at first I was a wee bit overwhelmed with the equipment list – even the ‘basics’ listed would’ve seen me needing to buy a reasonable amount of stuff. Which is all well and good if I was going to do more, but what if I didn’t? (Spoiler alert – I will). I also may or may not have bought a few other things meaning the month’s craft budget was looking a bit, um, anaemic, shall we say, so the less I had to buy, the better. Once I settled on the book I was going to make, I actually looked up the list of supplies. On top of the equipment I didn’t have, I also needed leather plus suede plus calf vellum (as in the real stuff, not the pretty paper version). Oh geez, what have I done? But I am nothing if not up for a make-do kind of project. I had nothing to lose, I figured, and I had the teal faux-leather on hand anyway. I had an order of letterpress cardstock to submit, so I slipped in a sheet of cover-weight flocked paper to use as the inner. And guess what? 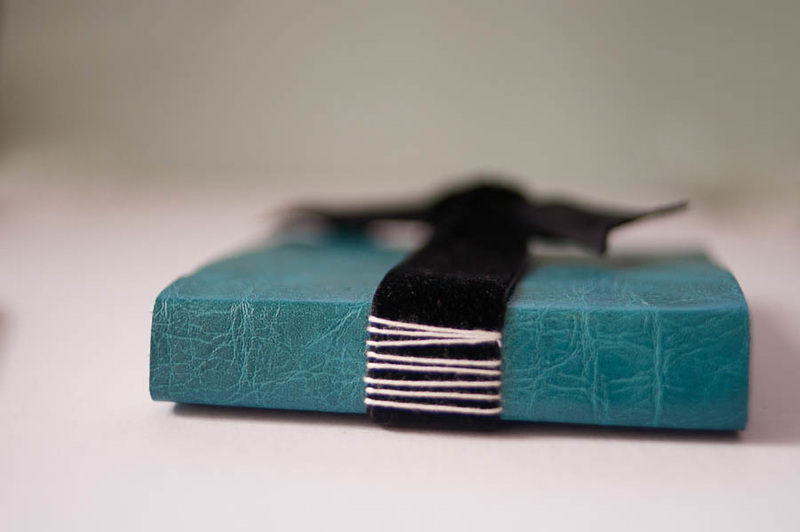 It worked a treat – as well as looking just a wee bit luxe – teal faux leather outer with black flocked inner, and a black velvet ribbon to hold it closed? Yes please! I didn’t have dividers like the instructions said, I just measured using on of my quilting rulers, and a metal ruler I have on hand. I didn’t have a bone folder to score the cover and crease the pages, I scored with an old embossing tool and creased with my thumbnail. I didn’t have linen thread or wax to make it run smoother, I just used regular old embroidery floss from my stash I have had for longer than I care to remember – teenage years at least (no I don’t have a hoarding problem, why do you ask?). I think it may be candlewicking thread? The embroidery variety, that is, not the hot wax variety. I’m not sure. It was a single strand floss, but a different texture to perle cotton. It doesn’t really matter, anyway, the point is, it was there, and it worked. The end papers were a couple of sheets of scrapping paper in the stash, and the text block was made from large A1 cartridge paper I had on hand. The moral to the story? Don’t be overwhelmed by a “must have” list of specialty equipment. It is possible in a lot of cases (though not all) to work around it with what you have (this applies to a lot of different projects, not just this book!). The project itself – it came together quite quickly, once I’d laminated the inner to the leather & left it to dry for a few days (more due to time constraints than it actually needing that long to dry). The instructions were clear and to the point, with plenty of photos to explain parts that may have been a little ambiguous. I think this book covered two double page spreads, so enough information without swamping you with lots and lots of details. I think the only negative was it took me a couple of read-throughs to work out what the go was with the end papers, but I think that was more my inability to use my brain, moreso than a failing on the behalf of the book. 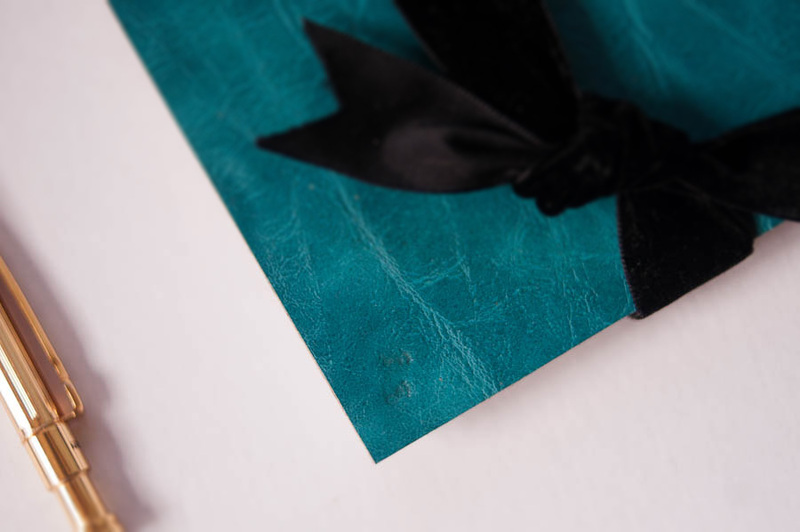 The flocked paper & faux leather worked beautifully in creating a cover that is firm enough to be considered a cover, but pliant enough to be able to score & fold. Would I recommend this book? A loud and clear YES. It is pretty. It has projects that would suit a mix of skill levels, including clear instructions for beginners. It is a book you could go back to time & again and try different techniques & styles. It is also not so prescriptive you can’t take the methods & use them in your own project inspired by but not identical to the book project – my faux-leather & paper take on the leather & vellum original is a perfect example. Would I buy this for myself? Again yes, so much yes. I am desperate to add this to my collection. I am a sucker for journals and books and pretty paper products, so this is right up my alley! Please note – this is not a sponsored post. I borrowed this book from my local library, and all projects were chosen & funded by me.